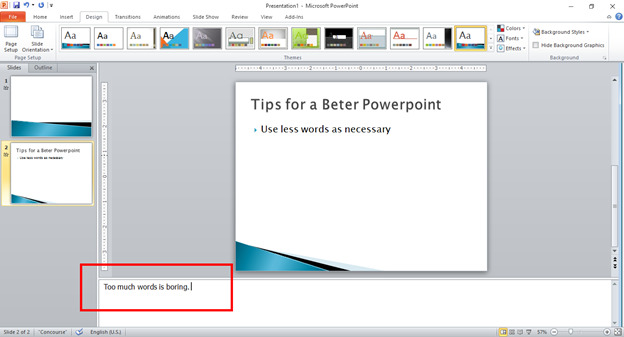 Making a PowerPoint presentation can be necessary at times. It could be during school thesis presentation or during boardroom business meetings. Whatever the situation, make it your main goal to impress and make your PowerPoint presentation engaging. Back in college it was painful listening to a lecturer whose PowerPoint presentation consists of slides filled with paragraphs literally copied from the textbook. It felt like reading an oversized book on the projector. In PowerPoint, fewer words mean stress-free slides for the readers. Put only your most important points and just expound on them as you present. Better yet, communicate your point with an appropriate, eye-catching picture then use the notes feature (located at the bottom of the slides) to place cue words or guides that will help you during your presentation. See this! Nobody likes sitting down to a PowerPoint presentation that contains pure text. Images make a PowerPoint presentation exciting. Eye catching, smart, humorous and mind-opening illustrations will nail your point if you know how to use them. But do not overdo the presentation with pictures. One or two images related to your points will suffice. Too many images will distract your audience’s attention and might stir up their imagination farther than the real point you’re discussing. Don’t create new slide designs every time. You don’t have to, and that’s so un-wise! You can use the available templates to ensure consistency across your presentation. In case the design you want is not available, you can create your own template using the Slide Master feature. The content of your PowerPoint presentation is meant to emphasize the points you are discussing – not substitute them. That’s why when it comes to font sizes the general rule is – the BIGGER the BETTER. If you think the font size is too small, then it probably is. A good rule will be to go not less than 30 font size. Always match this with Rule No. 1. Why big fonts? Because there should only be few. When it comes to font faces, take into consideration the personality of your audience and more importantly, the tone of your presentation. Sans serif fonts like Arial are recommended over serif fonts like Times New Roman. However, this recommendation should not limit the artist in you when it comes to experimenting for creativity’s sense. It’s best if you’ll only use a maximum of three font faces although one should be enough for the entire presentation. Lastly, make sure your fonts sit against a legible background. Avoid putting fonts on top of noisy images or an unreadable graffiti. Disaster!!! It happens when your PowerPoint file doesn’t have your font choices when playing it on other computers. I have seen many wonderful presentations appear fashionably lackluster because of this epic miss. So how do you save your font choices? 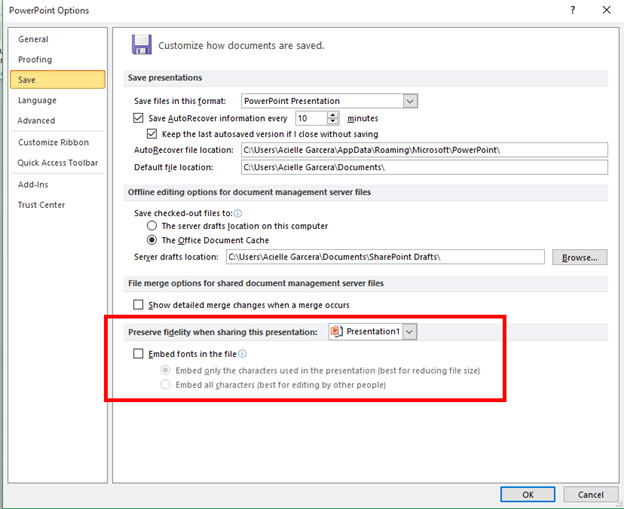 Save a copy of your PowerPoint file with the fonts embedded. This is available under the Save section in the Options window. Just go to File > Options > Save or check this out. 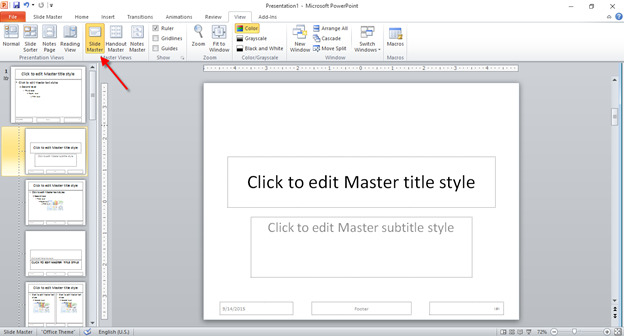 These basic tips should catapult you into becoming a PowerPoint guru in no time. Keep reading our blogs for useful tips and tricks on your favorite Office app.